The Russ Bassett Classic R-12 vertical cabinet, and the new Promedia lateral microfilm storage cabinets from are designed to provide maximum filing density for 16mm and 35mm roll film. Cartons or cartridges are filed in front-to-rear for easy identification and access. These microfilm cabinets are built of heavy gauge steel to provide years of trouble free service and are considered the industry gold standard for reliability. Full extension drawers assure easy access to all your roll film. Russ Bassett microfilm cabinets are available in either Neutral Gray or Black Smooth paint with a stable, no-off gassing powder coat finish as specified by the National Archives to protect your valuable media collection.. All other colors have been discontinued. – We have a few used Overfile cabinets left – See “Used Microfilm Cabinets” page. 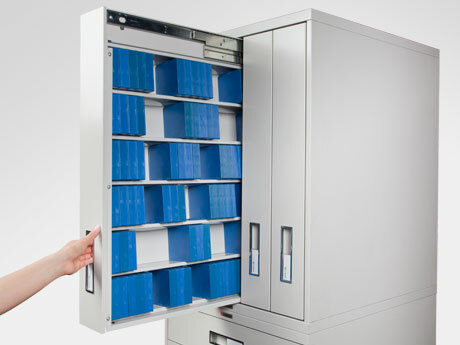 The RO-5 overfile microfilm cabinet is designed to be used with the R-6 and R-8 roll film cabinets and provides you with the greatest filing density per square foot.The vertical spacing of each self has been calculated to provide generous finger room with no loss of capacity. Weld nuts on the bottom of the RO-5 align with knockouts on the top of the R series’ cabinets. This allows you to bolt the cabinets together for a safe installation.